Hello fellow Gypsies (and everyone following along)! February marks the second month of our quilt-along. I hope you have been enjoying making these unique blocks. More of that to come! Here’s what’s happening this February for our quilt-along. Crazy Anne is our 1st block, located at top center of the quilt. Since half-rectangle triangles can be tricky to sew, you might like to machine paper piecing this block. Download a free paper piecing pattern for this block and for two of our March blocks at Quiet Play. The link to download is at the bottom of the post. You’ll be signing up for Quiet Play’s newsletter as well. Star Block is our 2nd block. It’s a bit below From the Heart. See Errata for a corrected diagram, if you have the original edition. If you have the new edition, it will state “Second Edition” on the Intro page. Indian Hatchet comes next. It is the chunky diagonal-striped block below Color Wheel. This is one of our easiest blocks! Puss in the Corner is our 4th and 5th block, as we’re making two this February. It’s a smaller block made up of a simple plus shape, flanked by triangles. I used Quiet Play’s machine paper piecing pattern to sew my Crazy Anne block. This block belongs in the true blue and deep purple section of my color-ordered Gypsy Wife quilt, so I was drawn the the royal blue and yellow print by Anna Maria Horner, which became my block center. The rest flowed from that choice. The bitty yellow triangles aren’t really following the pattern, but they help make that center square belong. I think my favorite detail is the diamonds fussy cut on diagonal at the corners of the block! If you are machine paper piecing, you might be wondering how to cut fabrics. Reference the sizes in the pattern booklet. Cut your pieces a good 1/2” larger than those pattern sizes, so that you have extra room! Congratulations to everyone who has competed their January blocks! Sometimes having a deadline is just the thing to help you make time for your favorite hobby. I enjoyed browsing all your lovely blocks at #Jan2019Gypsies, the hashtag for January’s goal. Today I randomly selected our lucky winner - Annette @MyLoveQuilting. I’ll be in touch, Annette, to arrange for your prize delivery. Kelli and I think that quilt-along prizes are a fun way to stay on task and motivated. Each month, January - April, you’ll have a chance to win a prize, so long you complete all the month’s assignments by the last day of the month. For February, you need to complete all 5 blocks (Crazy Anne, Star Block, Indian Hatchet and two Puss in the Corners) by February 28th. Post pictures of each of your quilt-along blocks to Instagram. You can post them one at a time or in a big batch. 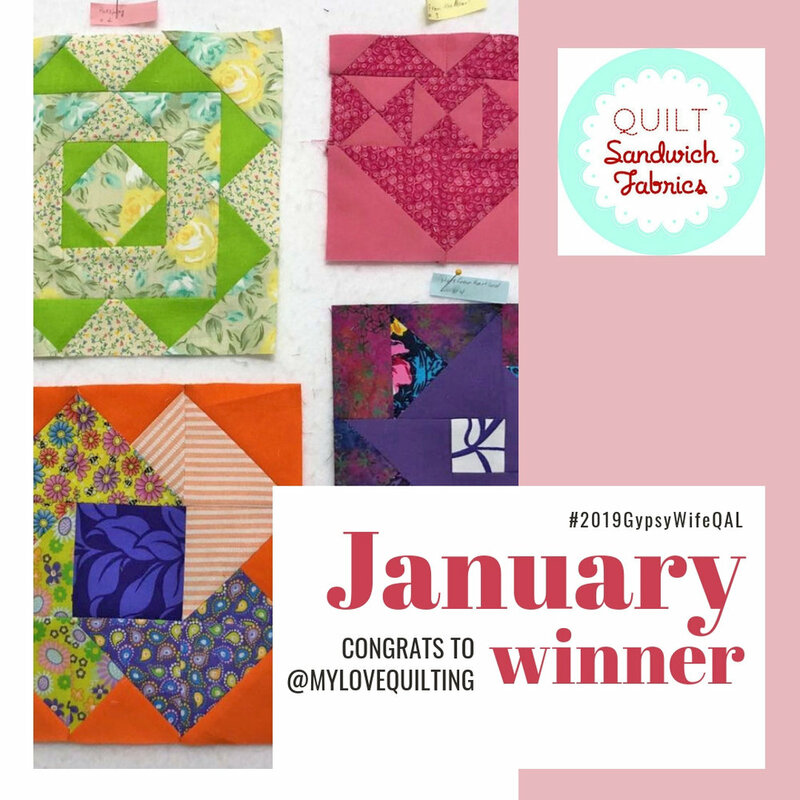 Each time you post Gypsy Wife blocks, please use #2019GypsyWifeQAL so that we can enjoy seeing your progress and cheer you on. Tag your final February block photo with #Feb2019Gypsies. That hashtag enters you into the pool of possible winners. Make sure this goes live by midnight in your time zone, on the last day of the month. Follow @StitchedinColor, @ScrappyViolet and our month’s giveaway sponsor. 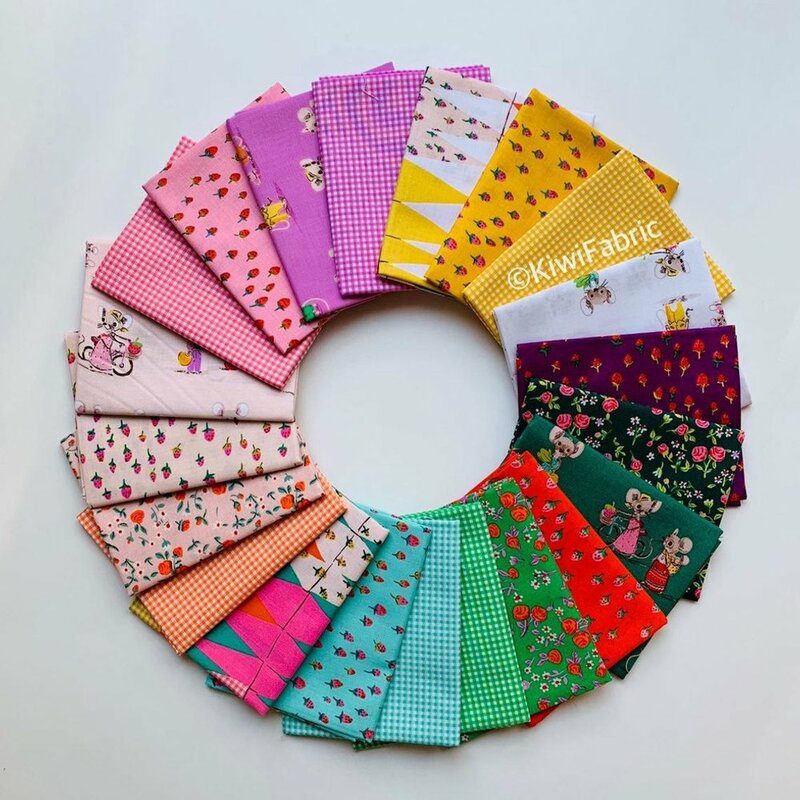 In February that’s @KiwiFabric. Cross your fingers! Winner will be randomly chosen and announced early in the following month. I think that’s everything, friends. Happy sewing!